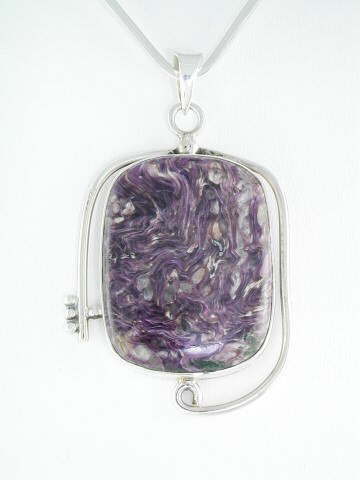 Lovely, large Charoite pendant in an unusual setting. Only recently discovered in 1978 in the Murun mountains in Yakutia near the Charo River in Russia, Charoite is a beautiful, vibrant purple stone full of movement, containing swirls, mottling and veining. Some say it takes its name from the river, other say it is from the Russian word for magic - 'chary'. Either way, it is a super mineral which is now becoming more readily available. In crystal healing terms it is considered one of the transformation stones, working best to help overcome fear and aligns with both the crown and heart chakras. Good quality specimens are excellent for Violet Ray or Violet Flame work.